Under the sea tranquility! Beautiful and calming this realistic effect fish swims the deep blue sea! Gorgeous with color layers to create an opalescent sheen. 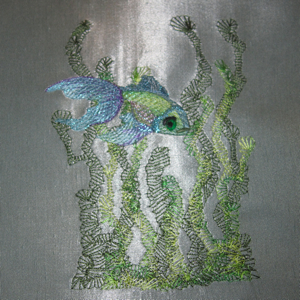 Shown above using variegated thread for the plant life and two metallic accent colors within the fish. Standard threads may also be used with this design and still achieve the realistic effect although with less sheen. The color layering itself creates the iridescent qualities.